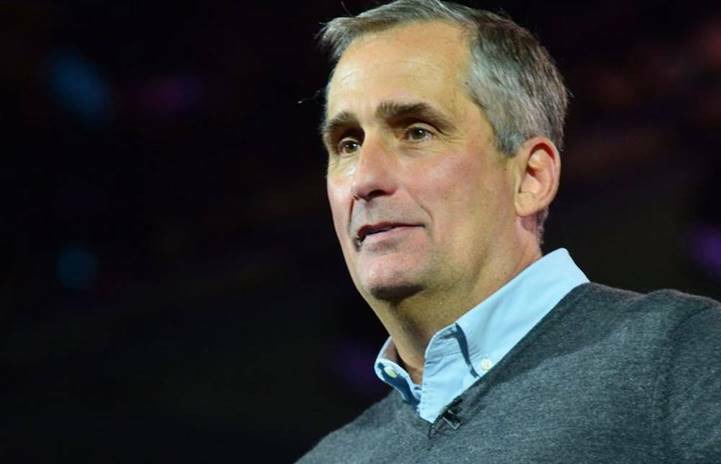 Last week I shared how Intel is making broad changes to accelerate our transformation by aligning every segment of our business – our people, our places and our projects – to our strategy. Our strategy itself is about transforming Intel from a PC company to a company that powers the cloud and billions of smart, connected computing devices. We head into that future with tremendous assets and advantages: our spirit of innovation, our technology and manufacturing leadership, and the trust of our customers. But what does that future look like? I want to outline how I see the future unfolding and how Intel will continue to lead and win as we power the next generation of technologies. There are five core beliefs that I hold to be undeniably true for the future. Our strategy is based on these premises, and the unique assets that only Intel brings to them. There is a clear virtuous cycle here – the cloud and data center, the Internet of Things, memory and FPGAs are all bound together by connectivity and enhanced by the economics of Moore’s Law. This virtuous cycle fuels our business, and we are aligning every segment of our business to it. Let me lay out how the parts of our strategy interact together and reinforce our growth. First is the cloud and data center. Virtualization and software are increasingly defining infrastructure in the cloud and data center, which plays to our strengths – we will drive more and more of the footprint of the data center to Intel architecture. However, these trends are only part of how we can drive the growth and full potential we have as a company. There is much more value to unlock from the cloud and data center, and analytics is the key to that. We’ll accelerate the power and value of analytics by continuing to innovate in high-performance computing, big data and machine learning capabilities. Second is the many variations of connected things. The term “Internet of Things” tends to be ambiguous, so it’s important to define it and then identify what segments Intel will drive. “Things” range from PCs to what we now call the Internet of Things. The Internet of Things encompasses all smart devices – every device, sensor, console and any other client device – that are connected to the cloud. The key phrase here is “connected to the cloud.” It means that everything that a “thing” does can be captured as a piece of data, measured real-time, and is accessible from anywhere. And the biggest opportunity in the Internet of Things is that it encompasses just about everything in our lives today – it’s ubiquitous. For most areas of industry and retail – from our shoes and clothes to our homes and cars – the Internet of Things is transforming everything and every experience. At Intel, we will focus on autonomous vehicles, industrial and retail as our primary growth drivers of the Internet of Things. Similarly, we view our core Client business of PCs and mobile as among the many variations of connected things, which is driving our strategy of differentiation and segmentation in the Internet of Things business. Third is memory and programmable solutions. 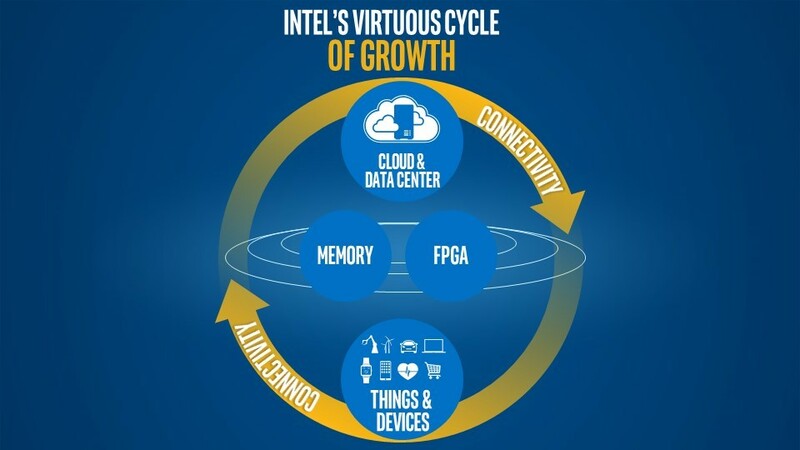 Rack Scale Architecture, 3D XPoint™ memory, FPGAs and silicon photonics are just a few examples of technologies that have been in development for several years at Intel and that we will bring to production soon. Over the next few years, we will bring many more breakthrough innovations and products to the cloud and data center infrastructure – revolutionizing the performance and architecture of the data center. Even more exciting, each of these technologies has a long roadmap that will allow for growth for years to come. Fourth is connectivity. Threading all of this virtuous cycle together is connectivity – the fact that providing computing power to a device and connecting it to the cloud makes it more valuable. A great example is an autonomous vehicle. It must have connectivity to the cloud, and the cloud must have machine learning capabilities to constantly be guided by the most up-to-date algorithms and data sets that allow the vehicle to operate safely. In this way, connectivity is fundamental to every one of the cloud-to-thing segments we will drive. As the world moves to 5G, Intel will lead because of our technological strength to deliver end-to-end 5G systems, from modems to base stations to all the various forms of connectivity that exist today and will exist tomorrow. Fifth is Moore’s Law. 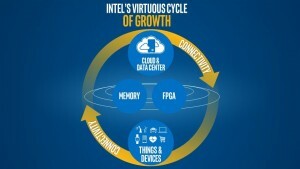 Moore’s Law is fundamentally a law of economics, and Intel will confidently continue to harness its value. The law says that we can shrink transistor dimensions by roughly 50% at a roughly fixed cost, thus driving twice the transistors for the same cost (or the same number of transistors for half the cost). This concept has fueled the technology revolution all of us have lived through. Intel’s leadership in Moore’s Law has driven the products delivering massive computing power growth and increasingly better economics and pricing. In my 34 years in the semiconductor industry, I have witnessed the advertised death of Moore’s Law no less than four times. As we progress from 14 nanometer technology to 10 nanometer and plan for 7 nanometer and 5 nanometer and even beyond, our plans are proof that Moore’s Law is alive and well. Intel’s industry leadership of Moore’s Law remains intact, and you will see continued investment in capacity and R&D to ensure so. We are in a time when technology is valued not just for the devices it produces, but for the experiences it makes possible. Intel will lead in this new era by remaining true to our history as inventors and makers, as a global leader in manufacturing, as world class innovators. We will also lead by becoming a company with a broader focus, and with sharper execution. In doing so, we will create lasting value for our customers, partners and shareholders, and achieve our mission to lead in a smart, connected world. It is an incredibly exciting time for Intel as we accelerate our strategy, and our impact. The work we do at Intel today will change this company, our industry and the world.